It’s been two and a half weeks almost and I’ve had an enormous pin set but no growth. Now a few are slowly but surely growing but they look kind of skinny and beat up around the stem. What could this be from? Maybe it could answer my question of why these are talking so damn long to grow. This is the first flush btw. 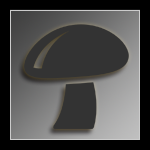 Tek- tray in a monotub. 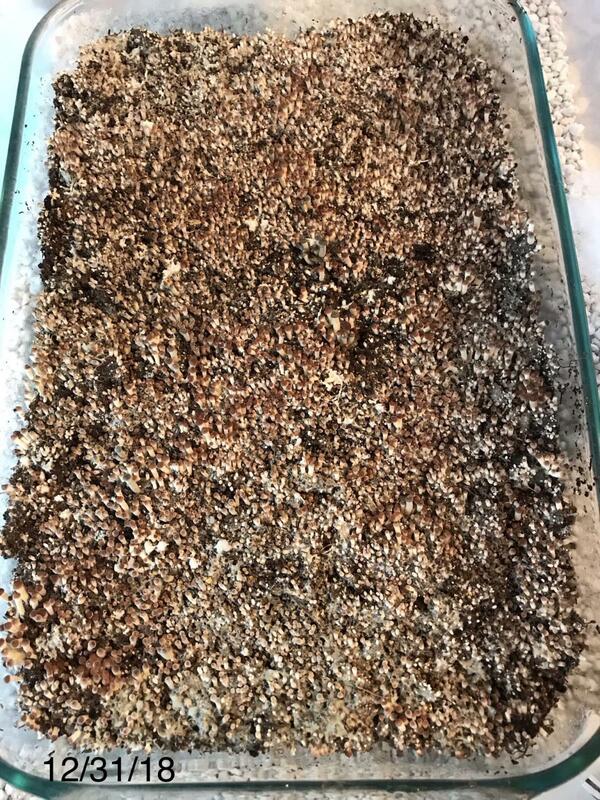 Rye berry & poo substrate. 4 polyfill holes around each side. Ceiling fan on in the room, humidity stays at 90 and temp is 75 inside. Edited by Hollydee2003, 09 January 2019 - 11:59 AM. Jesus.... Your pinset literally covers the entirety of the substrate surface... Pretty Rad even if they didn't mature as hoped!! That many pins probably sucked every drop of water out of the sub before they could mature. If you don't want to pick the aborts at a certain point the will pull less or close to none of the nutrients allowing the other pins to grow. If it we're me I would pull all the dark abort pins that aren't directly around an 'active pin'. Someone else with more knowledge on the situation may tell you better advice. I pull my a aborts as soon as I see them if they don't look like they will disturbed the mycellium network around the pins I'm focused on. 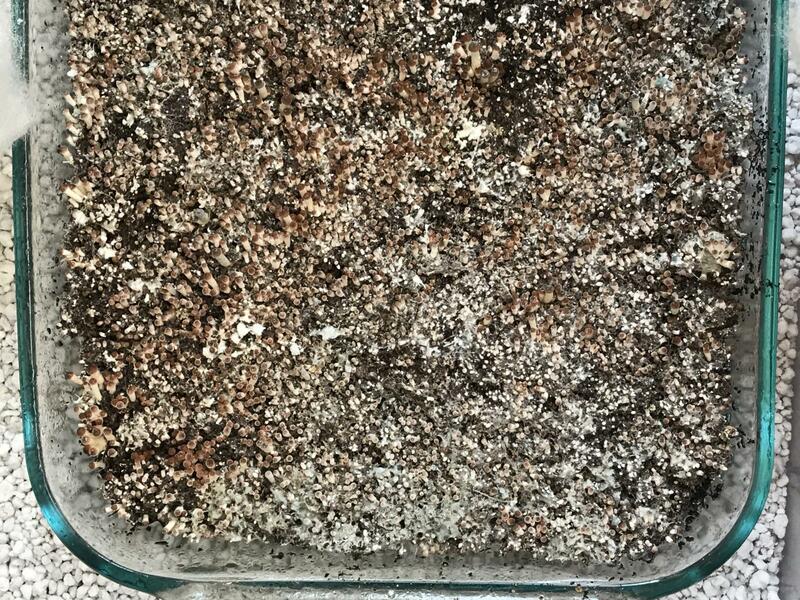 If it appears crusty and dry I've had success using sterile water and a sterile syringe injecting water directly into the substrate. Edited by MysticalMyco, 09 January 2019 - 12:50 PM. Yeah I was shocked when I saw how many pins formed. 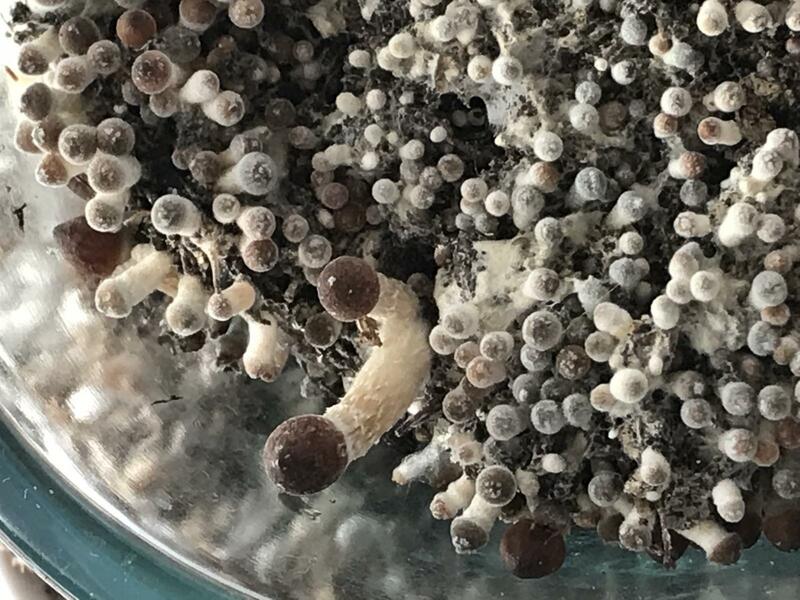 It’s been almost 2 weeks since the first pins appeared. There were way too many to pick by hand so I ended up having to break the sub off in portions and take a knife and try my best to scrape as much off as possible. While doing that I did notice that the sub was dry in most parts. I mixed all the sub up after that, put it in a tray and sprayed a bunch of water to try and hydrate it a bit. Do you think I might have a shot with that method with a second flush? 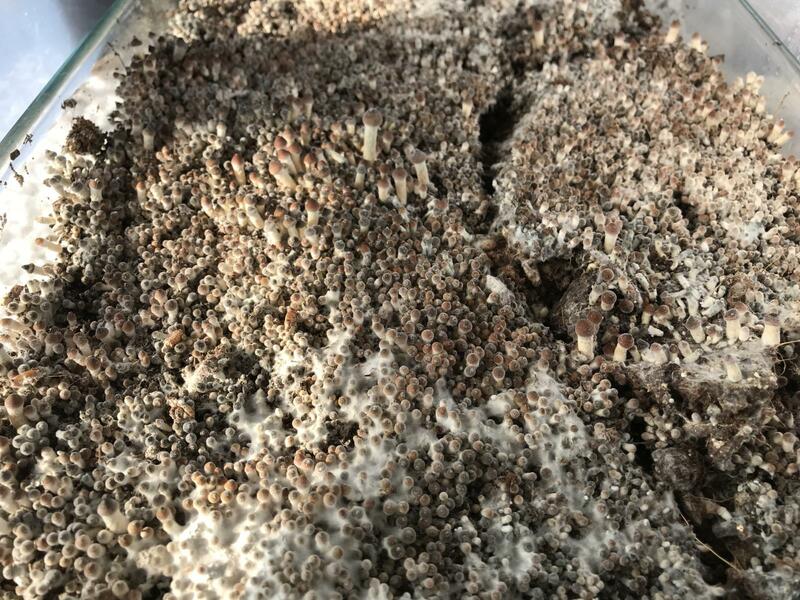 Here’s some photos from when the pins first appeared. Edited by Hollydee2003, 09 January 2019 - 01:15 PM. Yeah. Where did the substrate come from?It may be too rich or too fresh and its bacterial. That kind of pinset is never a good thing, it means somethings wrong. Seriously? NEVER a good thing? The type of pinsets have no chance of succeeding? Even just for a single flush? Those pinsets are often observed in weird genetics. I see this often in failed Crossbreeding. I'm surprised that nobody has asked what strain it is. BTW what strain is it? It’s B+ strain. The substrate came from outgrow. But I bought it over a year ago. It’s been sitting in the fridge this whole time. I did do a test batch on a smaller tray before I used it and it did just fine. As a matter of fact it was on its way to a fourth flush the whole time this one was still pinning! I just started making my own sub consisting of poo/verm/gypsum/coir and prints last week. I’ve got 3 trays colonizing right now. I’m so amped to see my final results.